November 11, 2018 – The award is given to physicians who demonstrate excellence in mentoring young academic clinicians. The American Heart Association (AHA) has awarded DCRI founder and former FDA Commissioner Robert M. Califf, MD, the 2018 Eugene Braunwald Award for Academic Mentoring. 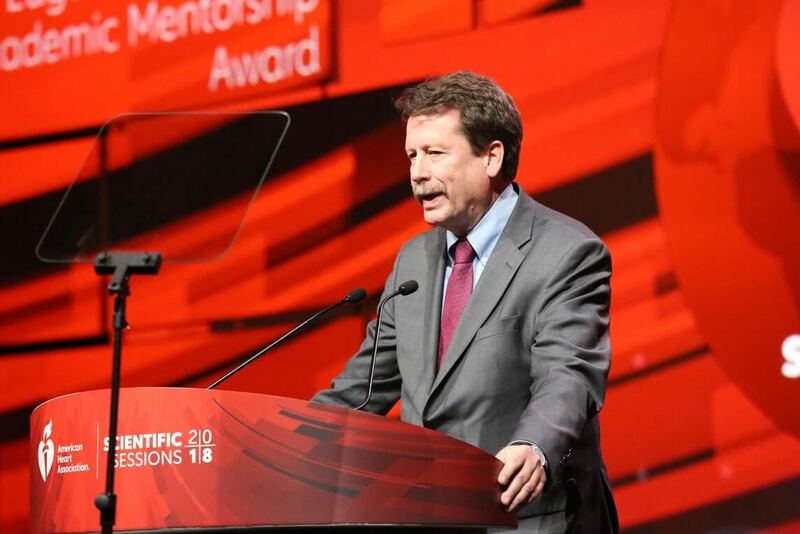 The award, which is given to physicians who demonstrate a consistent track record of outstanding mentorship of young academic physicians, was presented to Califf Sunday at the AHA’s annual meeting in Chicago. For Califf, who is currently the director of Duke Forge, vice chancellor for health data science, and Donald F. Fortin Professor of Cardiology at the Duke University School of Medicine, the award recognizes a commitment to teaching and mentoring that has been a recurring theme throughout a four-decade career as a cardiologist, researcher, teacher, and public servant. With the exception of an internal medicine residency at the University of California – San Francisco and two years serving as Deputy Commissioner and then Commissioner of the FDA, almost all of Califf’s career, including his time as an undergraduate and medical student, has been spent at Duke University. But despite his long association with Duke, Califf remains keenly aware that learning and mentoring are to be found in many places. “Mentoring is a two-way street,” said Califf, noting that some of the most profound lessons of his career have been imparted outside of academia. Although perhaps best known as a leading figure in cardiovascular clinical trials and as the founding director of the DCRI, Califf also taught and mentored multiple generations of academic physicians at Duke, incorporating continuous learning and teaching into the fabric of the institution he helped create. In addition to mentoring individual learners, Califf also contributed to the creation of innovative training curricula, including the DCRI Research Fellowship Training Program and the University of North Carolina-Duke Collaborative Postdoctoral Training Program. “Without question, he is the single most important influence in my professional development as both a cardiovascular clinician and a cardiovascular clinical researcher,” said Robert Harrington, MD, chair of the Department of Medicine at Stanford University and incoming AHA president. Harrington, who spent more than two decades at Duke as a cardiologist and clinical researcher, first met Califf in 1990 upon arriving at Duke to begin a cardiology fellowship. “He has an amazing ability to push people into areas where they are not yet accomplished, to step back and let them run a bit on their own, but to always be available when things don’t work out,” Harrington continued, noting that Califf’s mentoring style helped trainees to grow into true colleagues. His extensive contributions as mentor at Duke were honored in 2012 with the Duke Clinical Research Mentoring Award, and the DCRI’s award given to faculty for outstanding mentorship of fellows is named in honor of Califf. Among the numerous clinicians and researchers, and academic leaders that Califf mentored are Harrington and the Chair of the 2018 Scientific Sessions, Eric Peterson, MD, MPH, – both of whom also followed Califf in the role of director of the DCRI. During Califf’s remarks at the award presentation, he also issued a call to service. Noting that amid deep cultural and political division the United States is currently experiencing significant health challenges that threaten to erode hard-won gains in life expectancy and quality of life, he challenged his audience to continue to engage with the wider world outside of academic medicine. This entry was posted in 2018 News Archive, AHA18, Awards, Cardiovascular, News, News Feeds. Bookmark the permalink.